Our goal is to provide our clients with personalized services and solutions which are able to contribute to their business successes and development. Over the course of the previous years, we were able to establish a high-end partnership with many of the market-leading manufacturers, therefore we are always able to recommend the most suitable products and solutions to our clients. Our main profile is the establishment, development and operation of computer infrastructure. The members of our technical team have many decades of experience in the establishment, development and fully comprehensive operation of IT infrastructures, and also in the fully comprehensive operation of systems. Extending and updating the knowledge of our professionals is very important for us, therefore our colleagues are attending to trainings organized by manufacturers on a regular basis. We believe that continuous professional development is essential, as being the only way to provide our clients with services of the highest possible standard. 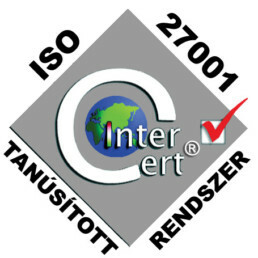 Our company has ISO 27001 certificate. ISO 27001 is an information security standard, published mutually by the International Organization for Standardization (ISO) and the International Electrotechnical Commission (IEC). It defines the requirements of the establishment, implementation, maintenance and continuous repair of information security systems within a given organization.